These are all such totally normal + valid questions, but they all kind of depend on each other and are therefore difficult to answer in one sitting. 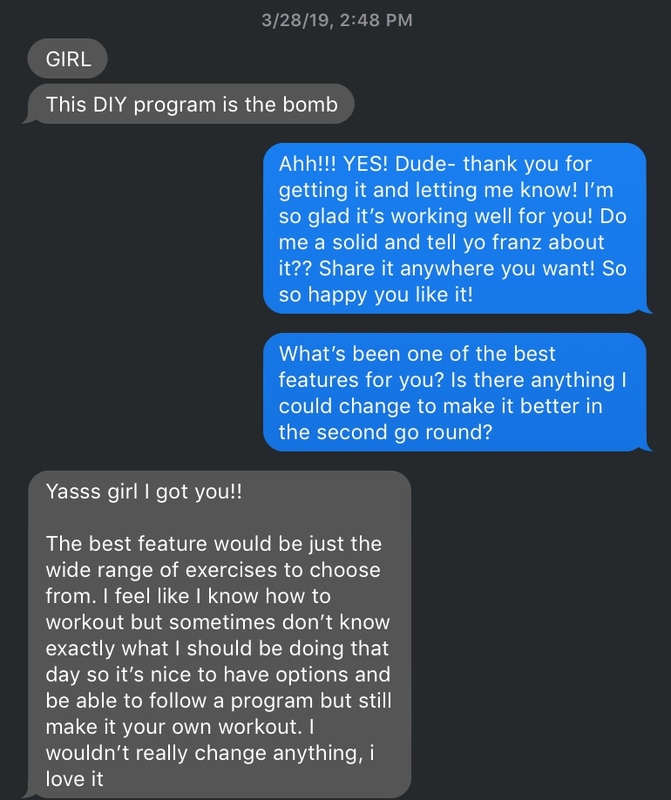 That’s why I created the “DIY Workout Program” — a one-stop shop that uses templates + exercise lists to answer all of these questions in a concise, clear & individualized way. First, decide how many days/week you’re going to workout. If 3x/week works best for you, find the corresponding templates, then use the exercise lists at the back of the guide to fill in the table with the exercises you choose! The exercise list is broken down by body part & has an accompanying YouTube video demonstration. I love this because it means you can pick exercises you’re comfortable with and also feel like you know how to do them before you even get to the gym! Want more info or want to snag it a discounted price?? Click here to learn more or get it for yourself! This Might Hurt Your Feelings.